Bakey and Betty are a warmly winning husband and wife duo. Their sound is a blend of old time country, jazz, ragtime and International music. The unique combination of their comedic charm and musical versatility makes for a lively earful of rarely heard tunes. Bakey’s guitar coupled with Betty’s washboard form a hard driving rhythm section for their over the top vocal harmonies while Betty’s solos take the listener to someplace dreamy. 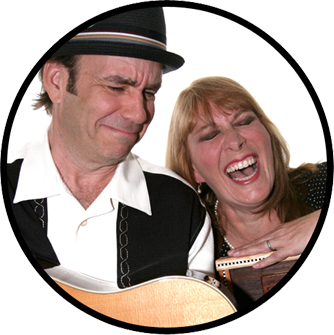 The high caliber of musicianship from each of them, together with Betty’s effervescent personality, have made Bakey and Betty a hit with their audiences from theme parks, dinner theaters, cabarets and music festivals to concert halls worldwide.